Let me start out by saying that I feel as if Kerebros made a serious error in the release of their “demo” of Sword of the Stars. This is not a demo. At least, I seriously hope it isn’t. It really seems to be more of a “beta demo preview” than anything else. What’s in a name? In calling it a demo, you set the expectations that you’re seeing a small slice of the real game (which you are). But after playing the demo, not extensively, but sufficiently, I can say that I would be a little worried if this was a small slice of the real game, as opposed to a teaser trailer/beta of a game in development. That being said, I’d like to start out by congratulating Kerebros in doing what they have, which is presenting a part of their unfinished product to the community. Reading the official forums actively in the wake of the release shows a number of excellent suggestions by the community that should (based on developer feedback) be integrated into the final game. Some of it is little things which you could easily see a closed beta/developer community ignoring (such as weapon stat pop-ups during ship design), others include the option to turn off the auto wait at the end of a turn. I think this sort of interaction with the community leads to a stronger game, and am glad to see Kerebros take this approach. Enough esoteric babbling, on to the game. First of all, the demo is free, if you have a file planet subscription (or know someone who does), so you have absolutely no reason not to download it and try it out, therefore eliminating the need for me to write anything more. Just kidding. 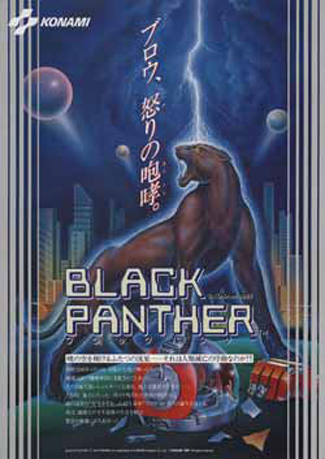 The demo allows for the play of two of the four races, and features a limited tech tree (about 20%), 40 star galaxy, 4 players per game and unlimited turns. It also supports multiplayer. Accordingly, you can get a pretty good feel for the game, but also see some very large gaps that come into play because of the limited tech tree. The game breaks down into four major interrelated components that I will cover: strategic gameplay, the tech tree, ship design, and tactical combat. I prefer to fly through black space, but blood red works, too. If I had to describe it, the strategic portion of SOTS is most reminiscent of the old, old school game Spaceward Ho (holla if you’ve played it!). The main difference is whereas Spaceward Ho was a 2 dimensional crappy game for apple machines, SOTS has an amazingly slick interface that looks awesome. For starters, the galaxy is actually 3 dimensional, which causes brain pain at first, but is really neat as you get used to it–you really feel like you’re working in space, as you freely rotate around all of the planets, stars, black holes, and other space crap in a truly 3-D galaxy. Unlike many 4x games, you don’t have tons and tons of variables and resources on a planet, nor do you construct buildings on planets. Instead, there are three factors: size, hazard rating, and resources. Size influences max population, hazard rating is how unpleasant (which can and is terraformed) the planet is and resources determine industrial output. 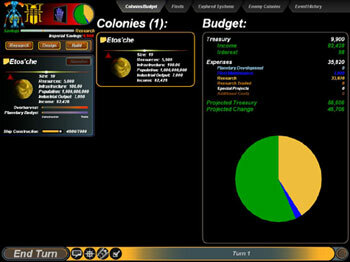 You can affect your colonies production/population/etc via technologies in the tech tree. As a planet is colonized, you allocate resources towards terraforming vs trade, and then growing the infrastructure of a planet. A planet is “optimal” at 0 hazard rating and 100% infrastructure, and then can turn it’s attention towards ship building and trade, which are controlled by sliders. Initially, I thought this lack of buildings (MOO2 players know what I’m talking about) would be a drag, but I’ve really come to love the elegance of the strategic part of the game. The tech tree is a bit obtuse, but also something that becomes more easily navigated as you play the game. That’s actually a theme of a lot of the interface: at first, it seems confusing as hell, but it becomes much more logical as you play the game. I assume this is a relic from the fact it’s basically an in-house beta (and obviously the developers can probably recite ship specs in their sleep), and the final version will be easier to navigate, particularly with a manual (all you get is a list of hotkeys and screen explanations in a PDF file). What’s unique about SOTS is that the tech tree has branches that are “randomized”: only about 70% of the tech tree is the same from game to game, meaning there are no solid, pre determined tech builds. It also means you have to adapt your strategy when fighting an opponent based on your tech tree and his. This is another feature I really like, since the one thing I hate about tech tree games is the need to follow the super awesome conventional wisdom path. With so many random techs, that’s no longer an issue. A pie chart makes any game more exciting. Ship design is very flexible, and a lot of fun. However, be prepared to get creative and know your weapons well, because the versatile ship design engine will force you to prepare for an opponent’s cheese tactics. The demo is limited to only one class of ships: destroyers. Destroyers have 3 slots: command, mission, and engines. The larger ships, cruisers and dreadnoughts, have more slots, allowing greater functionality. 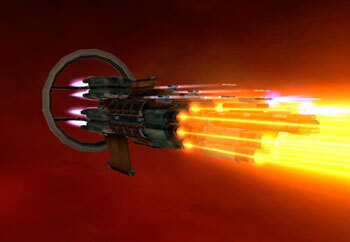 However, for the demo, we are limited to our specialized destroyers. The command function offers some special options, such as the “hammer head” which has more weapons, or “fire control” which increases accuracy of the ship’s guns. A command module usually has 1-2 turrets. The main body of the ship has many options, such as armor (the mainstay battle setup), torpedo (for torpedo weapons), spinal mounts (For huge weapons on destroyers) point defense, etc. Different modules have different turret loadouts, with turrets coming in small, medium and large sizes. From here, the actual weapons of each turret can be customized, allowing you a great deal of flexibility. You can have laser heavy short range ships, or missile launching monsters. 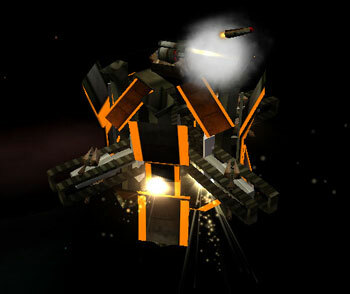 Certain weapons are also designed to fight certain things: accurate weapons are needed for faster ships, whereas slower weapons are designed to take out the large capital ships (not in the demo, but in the final game). Combat is fun, but there are a few annoying things. First off, due to the lack of a manual, it takes awhile to figure out to tell your ships how to properly engage. Once you get past that, you have to deal with the fact that there is a Z axis, but your ships get to decide on it themselves. This is a huge departure from Homeworld, where you could move on the Z axis, and especially frustrating since some ships and modules have turrets on the bottom, and one bad Z axis move restricts the field of fire. Next, because it’s all destroyer on destroyer combat, you lead to some frustrating nuances. For example, a command and control ship is needed to support more than a token amount of ships in combat and to control the order of reinforcements. However, the AI merrily suicide runs every CnC ship it can, and since it’s a piddly destroyer, it’s easily killed first. Supposedly, in the full game, CnC cruisers (and dreadnoughts) are much more robust, making this strategy less in viable. In the demo, it’s just frustrating. Other issues are that spinal mount weapons and photon torpedoes are designed to kill bigger ships, and therefore are fairly useless against other destroyers. So, if you’re like me, you were SORELY disappointed when your badass spinal mounted gun of doom never hit a goddamn thing. 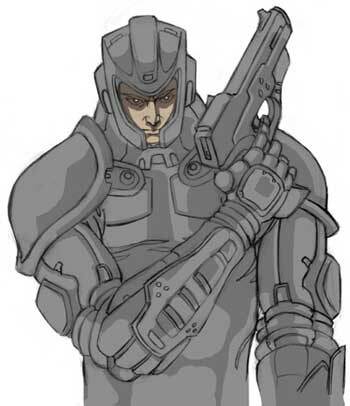 It’s fair to assume the character artist is in his gray period. Accordingly, because of the fact you’re only working with destroyers, combat tends to be fast and frantic, but I will say it’s a lot of fun. One very cool aspect of SOTS is that tactical combat is limited by time (you get to pick at the start of the game). The default is something like 3 minutes. 3 minutes can seem an eternity or a heartbeat, depending on what you’re trying to do: hold out for reinforcements, or bombard a planet into a slag heap before enemy reinforcements arrive. At the end of the time period, both sides withdraw to lick their wounds before engaging again (or fleeing) at the start of the next strategic turn. I really, really like this function and think it truly sets SOTS apart from other 4x games. Overall, I like what I see. The game still has a very far way to go, but the concepts are sufficiently strong that I’m excited for the final product game. There is a lot of work to be done in the combat AI front, and a lot of user interface to firm up. But the strategic side of the game is quite solid, and the tech tree is both robust and interesting. I’m also interested to see how robust the manual ends up being. For example, there are many racial differences, especially in some interesting, non standard areas (ship hp, turrets, tactical acceleration, etc), but these were only grudgingly, in a teaser fashion, given by a Kerebros employee on the boards. I’d like to see a total ranking/loadout on this data available in the final version, not to mention a full detail of all the ship modules/tech trees/etc. Although I respect the “discover it yourself” function, I feel that’s not the right attitude for a multiplayer game: all you’re doing is keeping the geeks who run insane playtests hits to their website as they post the rankings they’ve discovered (or hack .xml files). In conclusion, the best advice I can give about this game is to download and try the demo yourself: and my advice would be, SPEND A LOT OF TIME ON IT. Don’t give up after an hour, because it’ll take you about 2-3 to really learn how to play. Once you get over that learning curve, you’ll be in a good position to decide if SOTS is for you. I am very interested in the ship design part of the game. How easy is it to create these ships? I love the amount of detail you mentioned, but I wonder how easy it is to actually put all these complicated ships together. In GCII, the system is pretty simple, but it sounds like SOTS has more to offer than just being able to put blue dots all over my ships. It’s actually pretty easy, at least for destroyers. Each module (command, mission, engine), is a drop down with different options– I talk about some up in the review. Each module then has turret points (small, medium, large), that you fill up with the appropriate weaponry. Unlike GC2, you don’t get to design them asthetically, and also unlike GC2, combat is actually tactical, not just based on weapon values (10 laser vs 2 shields, etc), so the weapons you pick are a BIG DEAL. For instance, a PD ship is going to crush incoming missiles, so having 2 of these escorting your fleet against a missile heavy enemy is going to make their lives miserable, since the PD ship can cover OTHER ships and shoot down incoming missiles. In GC2, it’s just numbers vs numbers with pretty graphics. In SOTS, you really need to learn the weapon systems– what your enemy picks, what you pick, your race, and your play style all are very important. So in summary, I’d say it’s easy to design ships, but it’s much harder to figure out their role in the game till you’ve played it a few times and seen what matches up well against what. I learned that the hard way when I was super excited for my particle cannon spinal mount only to find out that plasma cannon weapons are terrible against destroyers and designed to be used against larger capital ships (which aren’t in the demo… doh). But i trully hoped for diplomacy, as in MOO 2-3 or at least as in Reach for The Stars (new one, of course not 198…something precursor). Alas, there were none. Downloaded the demo. Try to play for 2 hours. The interface has got to be the worst i have ever seen. I have no clue how to interact with anything. Boring, sorry, cant waste any more time on this one.